Editor's Note: The danger cannot be overstated. Hurricane Sandy has already claimed at least 67 lives - including 51 in Haiti. In the United States, schools are closed, businesses shuttered and mass transit suspended. Residents are being told to hunker down - and wait . Here is the full story. Not too much has changed in the past few hours.This is a very big storm.10s of millions w/o power.landfall location still a ? [Update 1:55 a.m. ET] Various primetime shows that are produced in New York (such as, 30 Rock, Smash, Elementary, Person of Interest) are being shut down Monday, according to Deadline.com, but the opposite appears to be the case with late night shows. Deadline says Letterman, who once taped a show during a blizzard, will go on - as will Jimmy Fallon. [Update 1:29 a.m. ET] CNN goes live a half hour early this Monday morning, but we will be providing regular weather updates throughout the night. We're not done yet! @cabreracnn will be breaking in on-air all night until @earlystartcnn begins at 4:30AM EDT & @jendelgadocnn takes over! [Update 10:04 p.m. ET] FEMA estimates that Hurricane Sandy has the potential to cause $2.5 billion to $3 billion in wind damage alone in the United States. The estimate, using standardized methodology called HAZUS, does not account for potential flood and other damage. [Update 9:44 p.m. ET] All bus carriers serving the New York area's Port Authority Bus Terminal - including Greyhound, Trailways and airport shuttles - are suspended because of the hurricane, the Port Authority of New York and New Jersey announced. [Update 8:55 p.m. ET] New York's Staten Island Ferry and East River Ferry services are suspended at least through Monday, according to the city's severe weather Web page. [Update 8:33 p.m. ET] President Barack Obama has declared a state of emergency in the District of Columbia ahead of the arrival of Hurricane Sandy, according to a release from the White House. Obama earlier declared states of emergency for Maryland, Massachusetts and New York. [Update 8:28 p.m. ET] Hurricane Sandy has caused at least 67 deaths, including 51 in Haiti; the other deaths were in Cuba, Jamaica, Panama, the Dominican Republic and Puerto Rico. 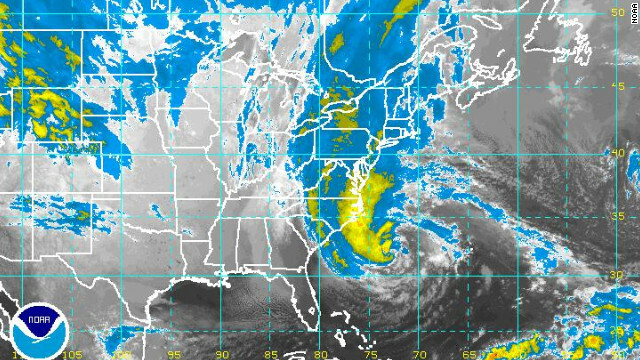 As of 8 p.m. Sunday, Sandy still hadn't veered toward the United States and was centered 280 miles east-southeast of Cape Hatteras, North Carolina, and 485 miles south-southeast of New York. The CNN Weather Unit forecasts that it will make landfall late Monday near the Delmarva Peninsula - which includes Delaware and parts of Maryland and Virginia - and southern New Jersey. [Update 7:53 p.m. ET] The closure of the public transportation systems in Washington, Philadelphia and New York means no subway rides for about 10.8 million commuters, according to average ridership numbers provided by the local transit authorities. [Update 7:33 p.m. ET] Boston's MBTA transit system will operate normally Monday and for as long as safety permits, the system said on its website. Commuter boat service will be suspended until further notice. [Update 7:15 p.m. ET] President Barack Obama has declared a state of emergency in the state of New York ahead of the arrival of Hurricane Sandy, according to a release from the White House. Meanwhile, New York City Mayor Michael Bloomberg urged residents to evacuate coastal areas because of anticipated storm surge. [Update 7:04 p.m. ET] Washington's Metro rapid transit system, the second-largest rail transit system in the country, will be closed Monday. It was unclear when the service, which supported 217 million trips in 2011, would resume. [Update 6:10 pm. ET] President Barack Obama has declared an emergency for Massachusetts, according to a release from the White House. [Update 5:55 p.m. ET] Federal offices in Washington and the surrounding area will be closed to the public Monday, the U.S. Office of Personnel Management said on its website. [Update 5:38 p.m. ET] Hurricane Sandy is disrupting the plans of both major presidential candidates. President Barack Obama canceled a trip to Colorado in order to stay in Washington to monitor the storm, although a visit to Florida is still on the schedule for Monday. Both he and Republican nominee Mitt Romney canceled events in Virginia. Romney canceled a campaign stop slated for Tuesday in New Hampshire. He is scheduled to campaign in Ohio, Iowa and Wisconsin, safely away from the storm, on Monday. [Update 5:24 p.m. ET] Philadelphia will suspend all public transit services with the end of service Sunday night. [Update 5:15 p.m. ET] The Nuclear Regulatory Commission says it will have on-site inspectors at all nuclear power stations that could be affected by Hurricane Sandy. The inspectors will be in place ahead of the storm and will stay at the power plants until the event is over. No power station has been taken offline at this point, but each station has protocols and procedures for going offline, NRC spokesman Neil Sheehan said. [Update 5:07 p.m. ET] The National Hurricane Center's 5 p.m. update placed the center of Hurricane Sandy about 300 miles southeast of Virginia Beach, Virginia, moving northeast at about 15 mph. The storm is expected to turn first to the north and then to the northwest early Monday. Maximum sustained winds at 5 p.m. were 75 mph, with higher gusts. [Update 4:50 p.m. ET] The New York Stock Exchange has revised it storm response plan and now says there will be no live trading Monday on the stock exchange's floor in Manhattan. Electronic trading by computer, which is how most trading takes place, will continue as usual, the exchange says. New York has declared a state of emergency and New York City has suspended subway service starting at 7 p.m. on Sunday. [Update 4:47 p.m. ET] Updated figures indicate classes have been canceled Monday for at least 2.1 million public school K-12 students along the East Coast in anticipation of Hurricane Sandy. [Update 3:30 p.m. ET] Stores along the Eastern Seaboard are running out of essential supplies such as batteries, water, generators and flashlights as people in Hurricane Sandy's path scramble to prepare for power outages and other effects of the storm. [Update 3:20 p.m. ET] At least 1.8 million students in major East Coast districts will be affected by school closings related to Hurricane Sandy, according to data compiled by CNN. The total is likely much higher when smaller districts are taken into account. [Update 3 p.m. ET] New Jersey Gov. Chris Christie says his state will begin a gradual shutdown of all bus, rail, light rail and Access Link service in New Jersey beginning at 4 p.m. Meanwhile, Washington Mayor Vincent Gray announced that all public schools in the district will be closed Monday. [Update 2:53 p.m. ET] U.S. stock exchanges will open for trading on Monday as usual, even as Hurricane Sandy is expected to make landfall in New York, the epicenter of global finance. The New York Stock Exchange is located on Wall Street in lower Manhattan, which is in a flood zone. However, not much stock trading takes place in the floors of the exchange itself, because investors trade from computers globally. The exchange said it plans to be open for trading on Monday. [Update 2:45 p.m. ET] Boston officials announced that city schools will be closed Monday because of Hurricane Sandy, according to the city website. The schools serve more than 56,000 pre-kindergarten through grade 12 students in 135 schools, according to the website. [Update 12:53 p.m.] The Port Authority of New York and New Jersey says all its trains and stations will close at midnight until further notice. [Update 12:13 p.m.] Gov. Lincoln Chafee has declared a state of emergency in Rhode Island and said he will speak with President Obama about storm preparations this afternoon. [Update 11:51 a.m.] Bus service in Connecticut will halt at midnight and stay closed for the duration of the storm, Gov. Dan Malloy announced. [Update 11:42 a.m.] Why could Hurricane Sandy send waters as high as 11 feet rushing inland? Because of its size, not its intensity, said Rick Knabb, director of the National Hurricane Center. “The system is so large that I would say millions of people are at least in areas that have some chance of experiencing either flash flooding or river flooding,” he said. Follow CNN's list of state-by-state preparations. [Updated 11:34 a.m.] People in parts of New York City are under mandatory evacuation orders, Mayor Michael Bloomberg said. The rule applies to people in "Zone A." To find out whether you or someone you know is in Zone A, click here. Evacuation centers have been opened in 72 public schools, Bloomberg said. All schools in the city are closed tomorrow. [Updated 11:02 a.m.] Sandy is holding onto hurricane strength and has picked up speed. As of 11 a.m. ET, its maximum sustained winds were at 75 mph as the storm barreled northeast at 14 mph. A tropical storm warning is in effect for coastal areas including a line from Cape Fear to Duck, North Carolina. Hurricane force winds are expected along parts of the coast from Virginian up through Massachusetts. On the current track, Sandy's center is expected to be near the coast Monday night, the National Hurricane Center said. When Sandy becomes a "wintertime low pressure system prior to landfall," it may strengthen a bit before weakening as it moves over land. See the latest NHC update here. And check out our coverage of how the storm could affect transportation throughout the Northeast. 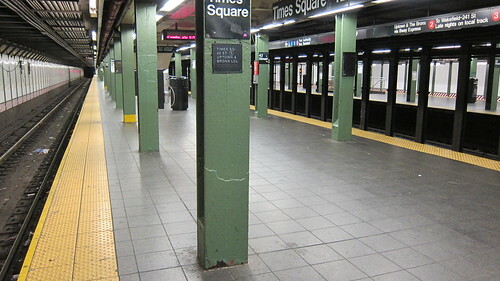 [Updated 10:11 a.m.] All New York City train service will stop today at 7 p.m. in advance of Hurricane Sandy, New York Gov. Andrew Cuomo has announced. The closure applies to subways and commuter rail service. The final Metro North and Long Island Rail Road trains will leave at 7 p.m. , he said. Bus service in New York City will continue until 9 p.m., Mayor Michael Bloomberg said. [Posted 8:31 a.m.] Hurricane Sandy is barreling its way northeast, and residents of the mid-Atlantic coast should expect life-threatening storm surges, the National Hurricane Center said this morning. Areas in its path include Long Island Sound and New York Harbor. Sandy is expected to be near hurricane force at landfall. As of 8 a.m. ET, the storm was about 260 miles southeast of Cape Hatteras, North Carolina, and about 395 miles from New York City, with maximum sustained winds of 75 mph. It was moving 10 mph. Sandy is expected to move parallel along the Southeast coast today and tonight, and approach the mid-Atlantic coast by Monday night, the NHC said. Read the latest NHC warning here. hope this helps in some way.... God bless! This message is not a reply, rather its just a comment to the situation in U.S. Here's a general piece of advice that i would like to share, a help. As we see light connections and phone connections being cut off, while no one to help, one should remember whatever happens to us our connection to One God never ends. Therefore we should all seek Help and Forgiveness from Him. Hope this disaster ends soon. Hello my friend! I wish to say that this post is amazing, nice written and include approximately all significant infos. I would like to look extra posts like this . It's actually a nice and useful piece of info. I am glad that you shared this helpful info with us. Please stay us up to date like this. Thank you for sharing.